If you have followed my blog for a long time, you know that I am fascinated by snowflakes. 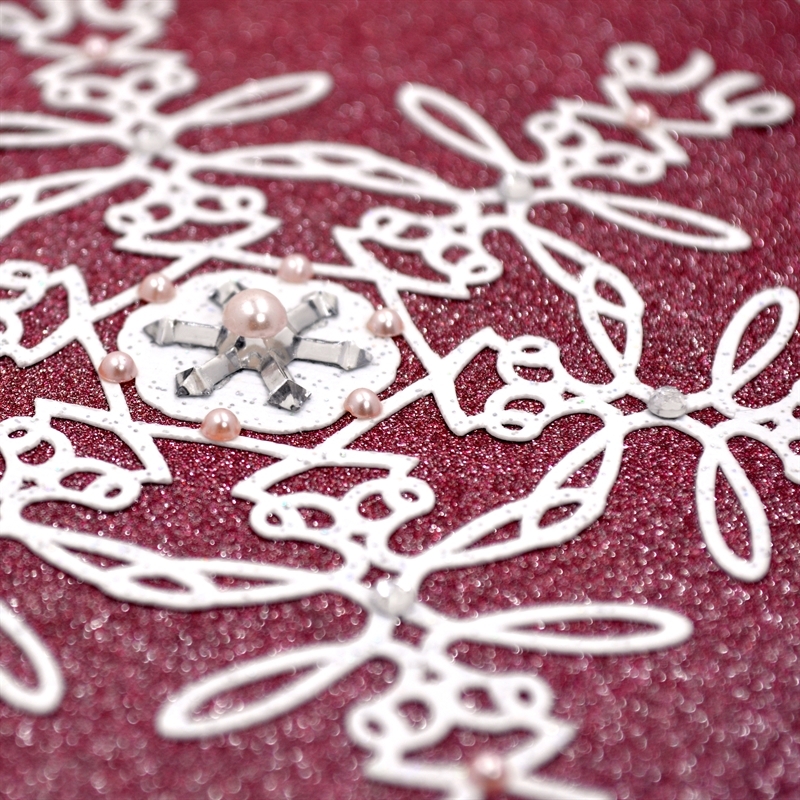 I enjoy designing all sorts of snowflake variations. I also like to try non-traditional color combinations for holidays. I designed this snowflake using the word "love" from the Paper Pups cartridge. This cartridge was bundled with my first Cricut Expression machine (purchased in 2007) and is not included in the Cricut Access due to licensing restrictions. (the red links are affiliate links). 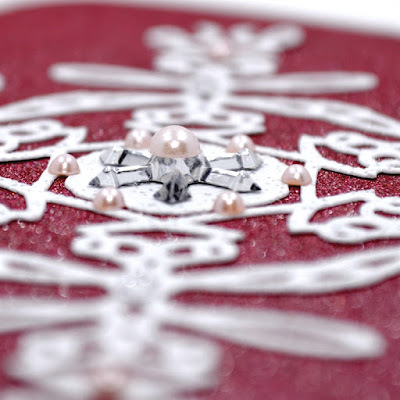 There was a great deal of slicing, flipping, mirroring, and welding required to create this design. The original image was the word "love" inside a circle so I had to slice the center section from the circle frame to get my starting image. I was working with the iPhone app when I designed this and the center was made solid by using the contour option on the iPhone app. Unfortunately, the lines that I can hide in the app do not stay hidden in the computer version of Design Space. 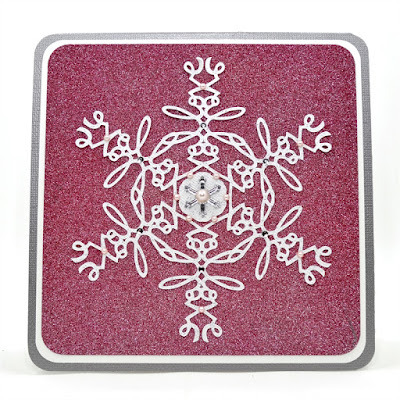 I suspect this is due to the fact that the snowflake shape has become extremely complex with all of the flipping and welding. I would like to share the file but I should let you know that when I tried to check on it before uploading a link, the image kept disappearing. 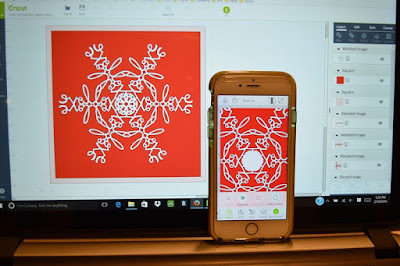 I will try to get this resolved or get more information from the folks at Cricut as soon as I can. 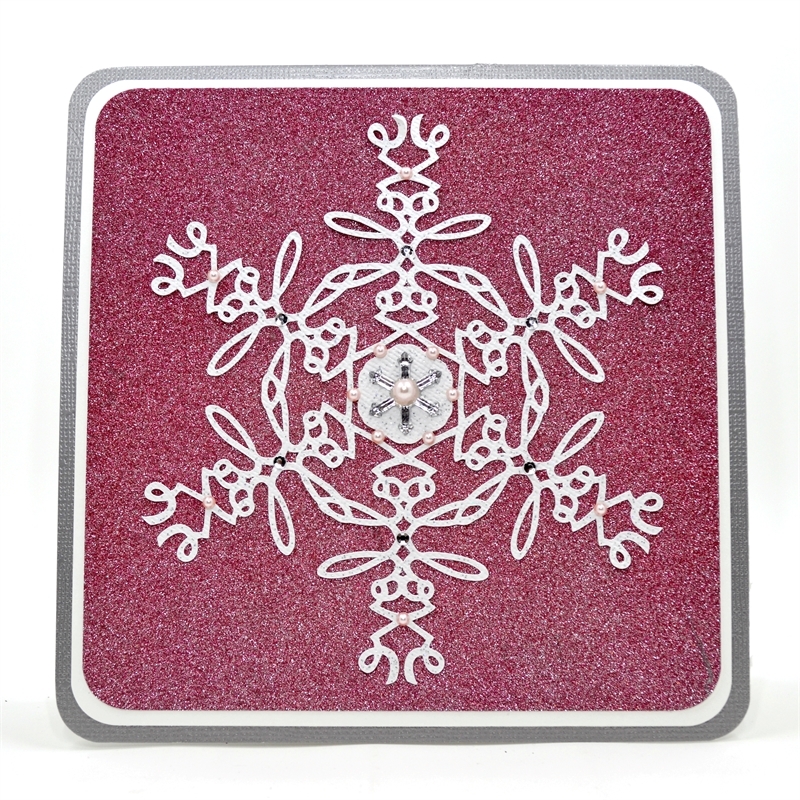 I cut the delicate snowflake design from glitter cardstock (Core'dinations Core Couture) and used another sparkly glitter cardstock for the top card mat layer. 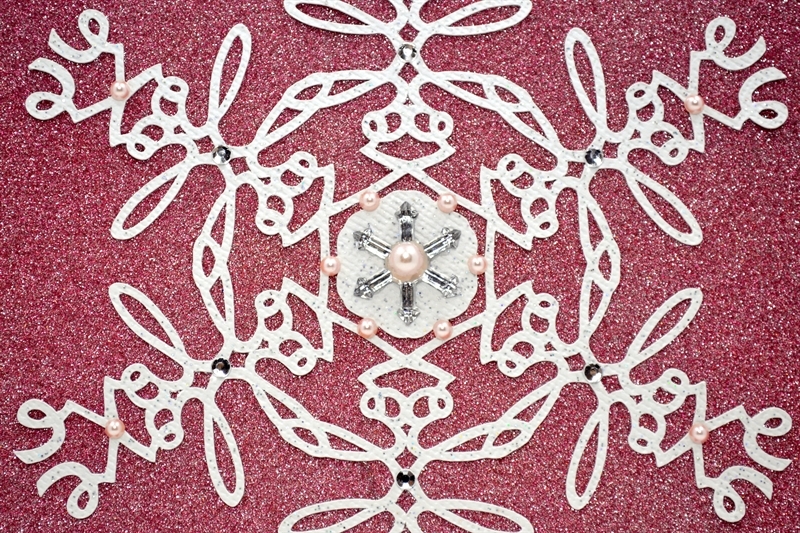 I added a center snowflake gem and more gems and pearls to dress up the cut to suit the sparkle of the card. 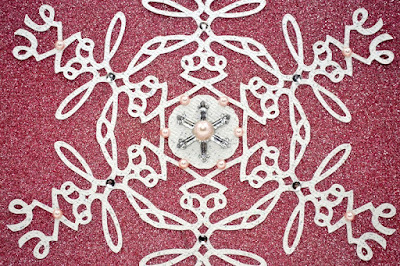 I even added bling on top of bling - a pink pearl on the center of the snowflake. 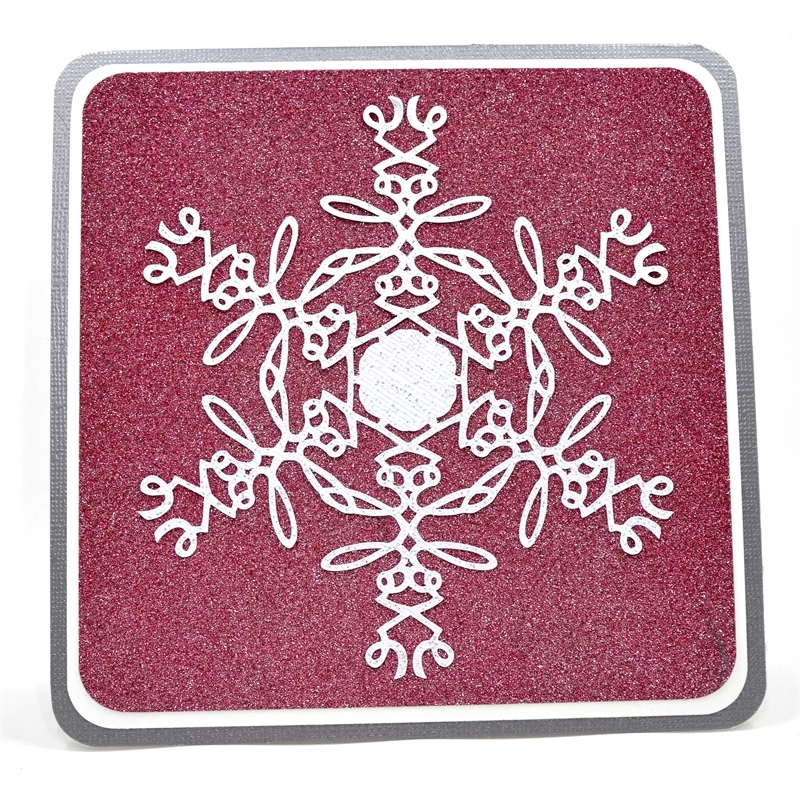 I cut the snowflake at about 4.5 inches tall which makes the width about 5 inches. The card is silver metallic cardstock cut at 12 x 6 inches for a folded 6 x6 card, the white mat is cut at 5 5/8 x 5 5/8 inches and the sparkly top mat is cut at 5 1/2 x 5 1/2 inches. I rounded all of the corners with a corner rounder punch. You should be able to find the file in Design Space HERE. It is possible that the link will not work - I will follow up to see if I can get the file to open consistently. If the file does open with the image, the center will not be solid. 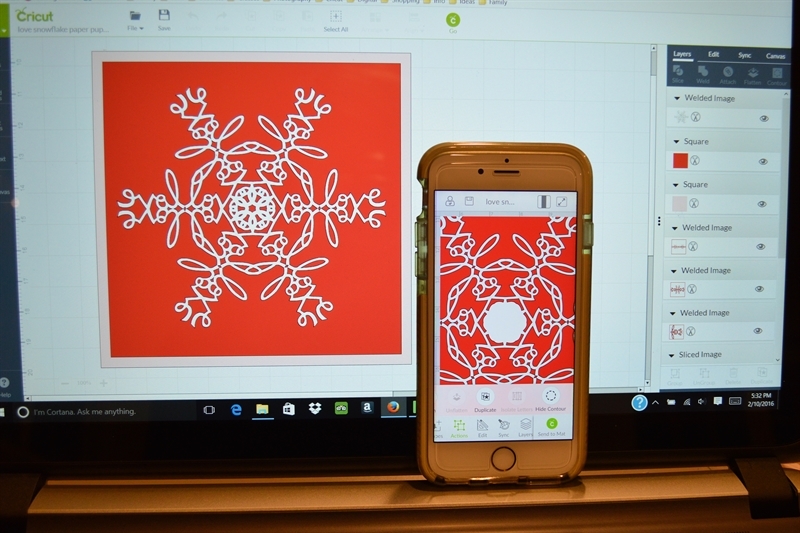 If you use the iPhone or iPad App you can try opening the file in the app and using the contour feature to hide all of the tiny cuts in the center of the snowflake. Another option is to add a circle or another shape to the mat and size it to cover any of the small cuts in the center - then weld the shape with the snowflake. Please let me know if the image appears when you try to open the file in Design Space - thanks! 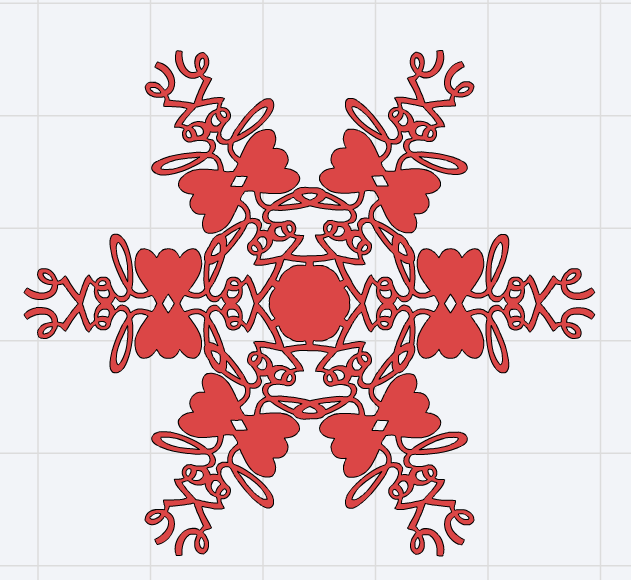 I decided to try remaking the snowflake and this time I used the "love" image with the heart and did not do any slicing to get the starting shape. I haven't tried cutting the file but HERE is the Design Space link - if you try it I'd love to hear and see how it turned out! We are expecting super cold weather this weekend. Please stay safe and warm if you are also in the path of this Polar Vortex! Your first file doesn't appear on Circut Design Space. However, your second file does. Just wanted to let you know. Thanks for letting me know Shawn. I don't now what the problem was but I made a new file and posted it to share on Saturday (February 13). That one should be fine - let me know if it isn't! Happy February - eight years later!